Today we’re going to talk about our beloved orchards, I know spring is already gone 🙁 but, I’ going to give you some tips for an organized crop and harvest. I have to be honest, I don’t have an orchard myself, we’ve been traveling a lot during the past years so even if I had the space to grow something, I wouldn’t be able to keep an eye on my beloved veggies and there are no “plant-sitters” around yet (sigh). So to gather all this info, I talked to an experienced Italian grandpa, he has been growing his own food for years, and he has become the “Veggie Guru” of the area, so people ask his opinion about their own plantings everytime they see them around. His name is Virginio and he became my “to go” person to talk about veggies and fruits, you know, casual conversations. I asked Virginio to let me visit his orchard and learn more about plants, care and, how he organized his crops. About 6 sprouts from each aromatic, but if you buy them already grown, you can totally buy less. From 15 to 20 tomato, peas, lettuce and rocket salad plants, 4 zucchini and spinach sprouts, 4 to 5 peppers and so on. You can totally plant whatever you like, this will depend on your taste. He explained that if you want at least half a year worth in vegetables, a family of three will need more than 1 sqm like you normally read online. Don’t get me wrong, planting in containers or small terraces will *always* be worth the try and, it’ll give you something to eat, however, what you can harvest from 1 container of peppers is not going to be enough for the rest of the month, nor the year. According to Virginio, if you want to take home a good supply of veggies, you will need more space, about 15 to 20 sqm is OK to grow vegetables from the list above for 3 people. This is about 15 sqm with a lot of space between sprouts, you can put one more line of them. If you have a terrace, you can always grow your own aromatic herbs, tomatoes, peppers, lettuce, arugula, zucchinis, wild berries (like strawberries) and even small trees (like citrus trees), everything is possible, so don’t worry, any space is a good space for a plant! Once you’ve selected the planting area, the next thing is to clean it from weeds, move the soil and add hummus and mix it together, that’s the base to start a project. Now, you have to select the space for every vegetable, for example, putting the tomatoes on the back of other small vegetables so every plant will have the same amount of sun. This layout will change around August when you’ll start again the seeding season. It is very important to change it so you will avoid plant diseases and other anomalies in the soil. For example: if you buy the little six-pack sprouts, plant them around March; after 30 to 40 days, plant another group of sprouts and repeat it again once or twice, that way you’ll have early and continuous harvests. If you can cover your plants forming a greenhouse, you can totally anticipate 1 month of planting, even more, if you live in warmer areas. Once a week, carefully move the soil around the plants with a hoe, it will help oxygenate the roots and the soil. If you need/want to fertilize your plants (with granulated or liquid organic fertilizer), do it around the total diameter of the plant, not directly to the stem, this way you’ll help the roots absorb the nutrients better. In late August / early September, you can start rotating the crops and changing the planting position. It will help maintain the soil fertility, control weeds, minimize diseases spread and pest growth. That’s it, for now, I hope you enjoyed this post as much as I did, I had a lot of fun at the orchard and learned a lot with Virginio. Hello people, it is Project Time!. I’m always excited about projects and I hope you are too, here you’ll find tips and ideas to apply to your own garden or terrace. Remember you can find me on Fresh Lemonade Gardens. Send me your gardening plans or questions!. A family of three (mom, dad and baby girl) recently moved into a new and bigger house in northern France, with a lot of green space to work on, they want to start by renewing their entrance area, where they have a garage and a secondary access to their house, but, it’s the access they see every single day, because it’s the garage access. They just rented a house that was inhabited for a long time, they have a bunch of old and dead plants that cover all the space. The garage area has also dead plants and they would like to cover it all with beautiful plants. Northern France has a wet weather, so they have grey days most of the time. They need a space where they can feel safe and bring to life their new home. They need an organized space (that gives them a “welcome home” effect) with low-maintenance shrubs. As the area is not attached to their house and they have to walk a few meters to actually enter the house, it is convenient to have small shrubs that leaves them a clear view, to see everything around. The garage has already a define flowerbed space and they want some evergreen (plants that maintain their leaves in cold weather) to cover it, like a Lavender mix (Lavandula angustifolia, L. stoechas, L. officinalis, L. dentanta) and a climbing rose at the back. They would like to have an ornamental tree that provides color and fun to grey winters. We are starting by cleaning the area to understand what we have over there and, let us have a clear vision of what we want. It’s a bit heavy work, but it’s important and worth doing it, trust me, you’ll feel much better after you see that clean and open space, sometimes you’ll feel it look bigger than you thought, and that’s so good, more space for plants! right?. Notice they have stairs that divide the “planting” area, we are going to use that “highness” to simulate different shrub dimensions. Edgeworthia chrysantha or paperbush: an ornamental tree is very resistant and can easily grow on container too, the Paperbush is a good option for this kind of climates. It likes partial-shades and with the right draining soil, it will grow and give you all the satisfaction you need in cold winters. It will thrive during winter with early blooms, in summer, it has a leafy and globe shape with big oval leaves. Sedum ‘Autumn Joy’: is a perennial bush, with succulent stems and leaves and pink blooms from August to November. It attracts butterflies. They like full sun or partial shades, it’s a low-maintenance plant and it thrives between ornamental grasses. Alchemilla mollis or lady’s mantle: is an herbaceous perennial, it loves partial-shades and blooms from July to August with small, bright yellow flowers in large sprays just above the foliage. Euonymus ‘Silver Queen’: evergreen shrub with dark green leaves and white edges. It grows well in full-sun or partial-shades. It will make your garden stand out in winter. Juniperus communis ‘Depressa Aurea’: it’s a dwarf conifer, evergreen with nice bronze foliage colors during autumn. It grows well in any type of soil and loves temperate climates. Carex brunnea: ornamental grass with clear cream/yellow leaves. It likes partial-shades and it’ll bloom in summer and it’s perfect to plant with other flowering plants to create a green “separation” in between. Brunnera macrophylla ‘Jack Frost’: another perennial shrub, with heart-shaped silver leaves and blue little blooms in spring. It loves partial shades and it goes well around ornamental grasses like carex. Tiarella cordifolia: this is a small perennial evergreen, it can become a groundcover if you leave it the space to grow. Interesting autumn foliage and blooms from April to June. Bulbs: I recommended a mix of irises, tulips and garlic bulbs, to plant next to the stairs and between small shrubs. This garden was designed to have blooms through all seasons. You can always plant them in containers and give them try. You’ll see that the “right” perennial plants are the solution to all your problems and will bring you joy with really low maintenance. The idea of having a garden is to have fun too, try it and let me know all about it! Best Evergreen shrubs and why you need one! This post idea came to me a few days ago, when designing a garden for a friend. As a designer, you always have (should) to explain your ideas and why you selected some materials, styles and in this case, plants. Some of them also want less dirt in their gardens, especially those who live in rainy places (you know, because of the leaves on the ground transforming into a slippery battlefield after a rainy day). As its name says it, an evergreen is a plant that maintains its leaves through the year, so it’s always green. The opposite of these trees or shrubs are called “deciduous” and they change leaves or lose their foliage during cold or dry seasons. Don’t get me wrong, evergreen DO lose foliage but gradually during the year, so they never get completely bald. The leaves age and they are replaced by new ones but their persistence varies depending on the tree, it can be few months or even decades. Why do you need an evergreen plant? Less work during the seasons, which means, less maintenance and less leaves-sweeping. It’s going to stay “alive” and green during winter when everything looks dead and dry around. Most of them don’t need to be pruned, so, less maintenance (again). They are perfect for indoor spaces. You just need it, trust me. Yes! The answer to all your prayers is in Evergreens! It’s spring, you’re in the supermarket trying to find the grocery shop list when all of the sudden, there it is! a beautiful bright pink cyclamen (or swinebread) that’s calling you!. You (obviously) buy it and after a few months, turns out that in summer they’re not quite what you expected, they are gone forever (not forever but you get the idea), now you are stuck with a nice vase with only the memories of your cyclamen, now you have to buy another vase to plant another summer plant which is going to have the same ending in winter. Maybe you count the days to see your beautiful cyclamen bloom again and that’s perfect!. But maybe, you just want a plant to give you joy all year around and that’s why evergreens are your to-go plant. Conifers: not all of them but pines, hemlock, red cedar, blue spruces, etc. Live oaks, rainforest trees, eucalyptus, clubmosses, etc. Lavender, rosemary, sage, boxwoods, holly, daphne, fatsia, camellia, euonymus, etc. Abelia: full sun evergreen, it also tolerates half-sun, a variety of soils and temperatures, although it’s better to protect it from cold winter drafts and severe winters. Viburnum: depending on the species they could be evergreen or deciduous, trees or shrubs that will bring long-year color to your garden and even terrace, because of their leaves changing colors on every season. They grow well in different soils at full sun or half-sun expositions. Skimmia: these are acid-soil loving evergreens, they stay green in winter and develop small red-pink buds that will open in spring and transform into tiny white flowers. They love moist and, well-drained soil. They grow well in shady areas. Pieris: its mature leaves are generally dark green, but the young leaves are the ones granting that nice clear and pinkish color. They like acidic, moist and well-drained soil, and they look perfect in groups and prefer full sun or half sun expositions. My first video about Grass-like plants! Grasses are one of my favorite shrubs to decorate a garden, there’s a vast list of varieties for every taste; small, big, golden, silver, rounded, tall, adapted to damp or dry soil, shady or sunny areas, and the list goes on. Ornamental grasses can be the focus element on most gardens, I find them so elegant and graceful, especially the tall ones, because of its “fountain” shapes and subtle movements when the wind blows. They can also be the perfect complement flowering plants to highlight its color and structure, some of them will grow perfectly in containers, so they’re pretty much perfect for any situation. Ornamental grasses mostly like sunny and bright positioning, but, they tolerate well a wide range of conditions. They need moist but well-drained soil and, the most important thing about them is that they are super low-maintenance plants, you just need to “feed” them with fertilizer in spring and that should be enough for them to do the rest. After giving you a quick summary of Ornamental Grasses, I wanted to talk to you about the Elegia tectorum, a gorgeous grass-like plant which was the inspiration for my first video in Cape Town. Cape thatching reed, deckreed, dakriet (Afrikaans), restios. Yep, this is <clearly> my first video, I explained a bit of this gorgeous plant in the middle of a windstorm, apparently XD (kidding, that’s normal weather in Cape Town o.O). So here’s the rest of the information for this ornamental shrub that I hope you like as much as I do. Elegia tectorum or restios are a superficially grass-like shrub endemic from the Western Cape Floral Kingdom or Fynbos, which is the smallest and richest of the world’s six floral kingdoms per unit of area. They grow together with proteas, pincushion, and ericas among others. Restionaceaes grow in greater variety in fynbos, they have symmetrical shapes and tufted red-like appearance. They have thin dark green stems and brown flowers, male and female flowers grow on separate plants branched inflorescences; female blooms are protected by golden brown bracts. They grow in sand dry soils in full sun exposition and plenty of air movement. Maybe you can find this shrub at home, maybe you don’t, there are other plants which can give the same effect and I’m sure you’ll know about them here. You can find an example of a garden with grasses on my Low-Maintenance Garden post, there I show you how to use them also in small spaces. Here we are again, with a new project and I’m very excited about it.I’m always excited about new projects, especially using low-maintenance plants to help my clients and you having a garden with no effort! The place: a nice garden situated in Lake Como, in a small house part of an antique Villa, surrounded by nature but in desperate need of revitalizing. My clients: a lovely newlyweds’ couple, transferred to an antique house a few months ago, they now have a nice and comfortable garden which needs some care. They want to start this project step by step and that’s a nice decision when you are not sure what to do and how it will look in the end, so it is OK to separate the areas and visualize what you’d like before running to the nursery. So, we decided to start with a small rectangular area, perfect for a flowerbed, situated right after the entrance door. This is the first thing they see every day, going in and out their new home so it was first on the list to fix. First, we have to consider if we want to keep them, this can reduce costs, time and work. Second, check for unhealthy plants, this way you’ll know if it’s worth to keep them, replace some of them or simply remove them. In order to make this area pop, we need (as I said already) color and texture, and we’ll get it from some special shrubs. You’ll probably know them already, but, the first one is going to make you remember grandma’s home: it is the Butterfly stonecrop. Before you think about grandma’s garden again (in a negative way), let me show you how it will mix perfectly in contrast with other structured plants. A touch of color will be given by mixed bulbs and tall vervains. Texture contrasts will be given using small shrubs to fill some angles and renew this old area. Butterfly stonecrop (Hylotelephium spectabile ‘Brilliant’): formerly known as Sedum spectabile, is a perennial with compact shapes, cultivated in full-sun, part-sun, and well-drained soils. They look gorgeous in rock gardens and they give all their best in autumn. Couple with perennial grasses they’ll look amazing. They have light green foliage, pink blooms between September and October and they’re low maintenance. Drought and heat tolerant, they grow 45cm tall and 60cm wide. Also excellent to grow in pots on a sunny terrace. Fountain grass (Pennisetum orientale): it is a low-maintenance/easy to grow grass. They are super resistant and tolerate any soil, so they’ll grow nicely in well-drained soil. They like full-sun or part-sun exposition and blooms from June to October. Green-grey leaves and light pink blooms that change colors in autumn. They grow 50 – 60cm tall. Purpletop vervain or tall vervain (Verbena bonariensis): this amazing plant will give a nice touch of color, highness and “air” with its long and thin stems. This is an ornamental perennial plant that grows well in well-drained soil in full-sun and part-sun areas, it has dark green stems that “die” in winter and re-grow again in early summer. It has small purple flowers that bloom from summer to autumn, sometimes they last until late October. It goes from 1-1.5 m tall and 30-90 cm wide. Lamb’s ear (Stachys byzantina): small and compact shrub, ornamental with soft silver leaves. Perennial, but it also dries in winter and re-grows in spring. It makes stand up pink, blue and purple blooms,. It likes a well-drained soil although it also grows well in rock gardens in full-sun expositions. Depending on the species it goes from 30 to 50 cm tall. Bulbs: you can mix and match whatever bulbs you want, always!. Things to consider: highness and colors. In this case, some purple blooms would go perfectly so I choose Allium schoenoprasum, but you commonly call them chives. This is a perennial plant that grows from 30 to 50cm, flowers are pale purple and has dark green grass-like leaves. It would grow nice in full sun and you can plant separate bulbs or in groups depending on the final look you want for your garden. I propose at least 3 bulbs together, they will multiply next year so it all depends on you, I like the informal look. Lamb’s ear and chives working together! The idea of a nice garden is to make it as natural as possible as if those plants grow spontaneously. Don’t be afraid to mix and match, it’s nice to have different shapes contrasts in your garden, so, if you have any questions, you know where to find me!!! 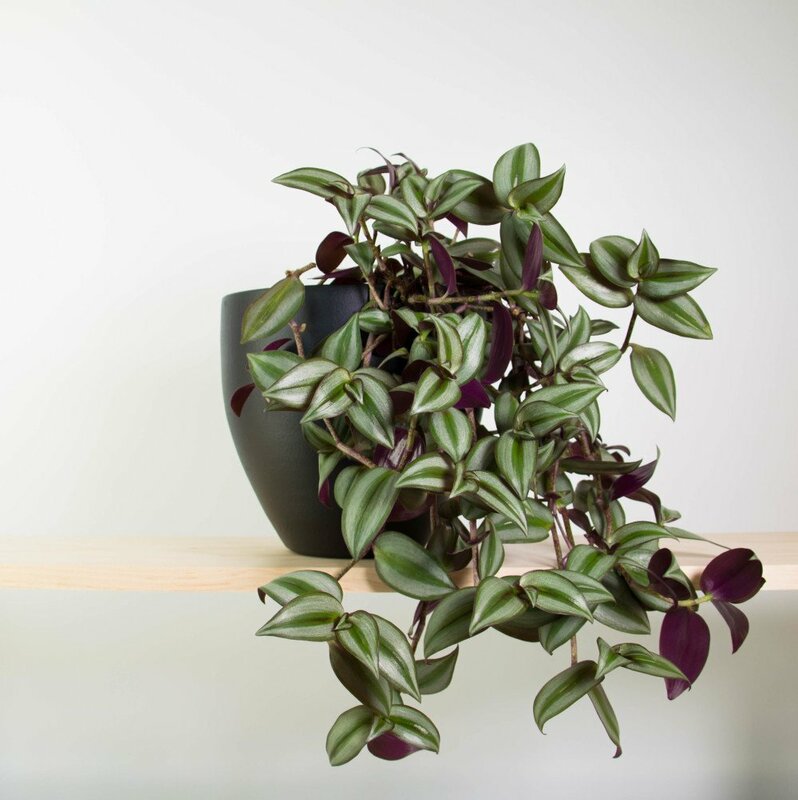 Boost your productivity with these low-maintenance houseplants! Here I am again with some more tips and ideas to help you transform your own space into a fresh and relaxed one with the use of plants. This time I’m showing you a project for a Home Studio (or home-office, I just don’t like the word “office” anymore, be patient with me 🙂 ), my clients work at home and they weren’t feeling it, they were bored of the space, there was no life and it was affecting their mood and their way to engage with the space. Sometimes we don’t realize that small changes can brighten up our day, that’s why I keep repenting we all need “fresh” spaces, where we can breathe and concentrate better, in this case: working better. They have a small studio, about 12 sq.m, it may seem small but they do have a lot of indirect light and I wanted to take advantage of that with the use of succulents, because, let’s face it, if you’re working, the last thing you want to think about is plant’s caring, and they will make the difference. The project includes low-maintenance plants, each of them with a lot of character because sometimes, transformations require being bold, and these plants have everything we want. Is an ornamental, evergreen, perennial plant. Evergreen means that even in colder seasons they’re going to maintain all their green leaves. Leaves grow vertically about 70 to 90 cm, dark green color with yellow edges when mature. It is perfect as a houseplant because it can tolerate low light and irregular watering. It will highlight every angle, and in this case, we’d placed it in a narrow niche to give the illusion of a taller space. I chose this plant because of its colors, so beautiful and intense. When decorating, we also have to think about shapes and this one has it all. It grows well in indirect light and dry to wet soil, obviously, it has to be a balance, but you’re going to be fine with them. The falling shape makes it easy to find a high spot on a library, a shelf or in this case, the top of glass doors. Is a cactaceae family member, small dimension plant, they need direct light, but, indoors, it’s better to place them in a bright place but avoiding direct sun through glass windows, it can be too intense for them. They like breezy areas so it is ok to open the windows and let them have some air in summer. If you find the right place for them, they’ll bloom in summer, forming a little “crown” around your cactus, it’s really pretty and perfect for a bookshelf or in a high space so you won’t pinch yourself constantly 🙂 it also works perfectly by itself or in groups. Give it a try! it’ll make you love cactus. Small but equally ornamental as any other big plant, it’s a succulent with chubby leaves and white reliefs on the bottom that cross the leave all over them with (like a zebra). It can grow from 5 to 10 cm and needs a nice amount of light during the day, but, as I said before, it is better if you can avoid direct sun especially in summer. It’ll look amazing in a small container with other plants, but this time, we’ll keep it alone. If you have clear walls (for example) it will stand out without efforts!. There you go, now you have character and colors in a small room, with no effort, no added furniture, and practically no deep plant care. Plants make our life better and sometimes you just need small steps including small but full or style plants. Best Low-Maintenance houseplants that also work as air-purifying! Everybody (including me) want the perfect living-room but sometimes it feels like a never-ending homework of details, and to be fair, sometimes it is, that’s why I’ll show you how to make the difference in your living-room, make it stand out with some beautiful and functional plants and especially, no effort required!. This topic came to me because my husband and I are moving into a new house, we are leaving a downtown apartment, to live in a house, surrounded by nature, with a real garden and a bunch of noisy roosters around… but we love it!. Somehow this has become a goal for some people, they’re getting tired of living in the city chaos and they’re connecting more with nature, but, that’s another topic for a different post. This low-maintenance plants also require low-light orientation, so they’re perfect for your workspace! Indirect light: they need moderate to indirect light so finding a place for them will be easy. Moist soil: most of them are native to tropical environments so humidity is important for their growth, but remember: Moist doesn’t mean Wet! Green leaves are healthy leaves: if you see some brown tips, pale green or sluggish leaves, check the soil, something’s not right. Fertilize: they need nutrients just like us, give it to them. Remember: is better to water your plants with abundant water in long intervals, that way, the water can go deep in the soil, the roots will grow down to feed themselves and be protected. If you put little water, the roots will stay in the soil’s surface, so whenever you forget to water them, the roots will dry quickly enough to damage the plant. Sansevieria trifasciata or Snake plant: an ornamental evergreen, its young leaves are dark green and with time they get that nice yellow edges that will stand out in your living room or workspace. This is one of the most tolerant indoor plants, they grow by rhizomes so they need a good and draining soil; they can root easily, so few water is more than enough to take care of this elegant and structured plant. NASA research has shown that snake plants are able to clean the air, filtering and removing toxins like formaldehyde and benzene formed at home. Dieffenbachia or Dumbcane: an ornamental evergreen with different dimensions and colors (depending on the variety), It has big leaves in shades of green, yellow and white that will decorate your room very elegantly and it definitely will stand out from any angle. It rarely blooms indoors and it likes a moist drained soil. It’s convenient to rotate the container just to make sure that it can receive light in a uniform way. – Removing the dry leaves to avoid fungus. It is important to know that the leaves if chewed or eaten are poisonous, so place it where babies or pets can’t reach it. Hedera helix or English Ivy: this one can survive every condition, sun, shades and little water, it is a warrior and you can take care of it, trust me, you can! This climbing and/or falling plant is an evergreen perfect to grow indoors with indirect light, they even survive in shady angles but the leaves will lose its variegated margins and stay dark green. You just have to maintain a moist soil watering it about every 7 to 10 days (depending on your home temperature) during winter and if you don’t want/can’t do it, you can buy a special container with a water dispenser and you’re done, no headaches for you. Epipremnum aureum: also an ornamental with nice heart-shaped leaves and clear green-yellowish lines, very decorative, subtle and romantic, with nice and soft falling shapes. For this plant, you can use an aerial container or a simple vase on the edge of a library to let the leaves fall. It grows fast so it’ll cover your corner in a few seasons and of course, it will clear the air at home. They love indirect light and water every 8 to 9 days in winter. Ficus benjamina or Weeping fig: is an erect plant with a tree-like shape, dark green and glossy leaves. It will make a statement in your living room so don’t be scared to use some big indoor plants. They are slow-growing (up to 3m tall) and they will bright up and refresh your room. Water roughly, then allow to dry out slightly between watering, it does not tolerate soggy soil. Keep soil slightly drier in winter. This fig tree will help you breath easier being one of the best plants used to improve indoor air quality, it’ll help you remove rates of toxins like formaldehyde, benzene, and trichloroethylene. They like bright indirect light and no air drafts, in early fall it will lose some leaves but, they will be fine by spring, this is a long-lived house plant so if you take care of it, it will take care of you. Chlorophytum comosum or Spider plant: considered one of the most adaptive plants and one of the easiest to grow, so it’s perfect if you want to try your abilities and “green thumb” with “one” plant at a time; its spider-like leaves are clear green or variegated. – Moist but not soggy soil, let it dry between watering. Dypsis lutescens or Areca palm: also known as butterfly plant and awarded the Royal Horticultural Society’s Award of Garden Merit; NASA tested it and concluded it is one of the best plants at cleaning air at home and working spaces. Dark and shady areas or direct sun are not good for them, so try to find a place in between (indirect light) at home so they can grow big and stylish as they are. This plant is always thirsty, but don’t exaggerate with water, there’s have to be a balance. Chamaedorea seifrizii or Bamboo palm: they have dark green leaves and erect strong stems, they’ll grow well and fast (in comparison to other indoor plants, about 2 to 5 years) if placed in a bright place with indirect sunlight; they don’t like sitting water, it can rot the roots and stems. You will notice if you are overwatering if new leaves are clear green and you’ll notice some brown tips or brownish new growing leaves. This plant will give you instant gratification and that’s what we all want in a plant, right? If you take care of it, it will give you years of nice foliage at home. It also grows well in bathrooms and you wouldn’t have to water them so often. Clean the leaves every now and then with soft soapy water and if you want a regular and even palm shape, turn the container every week or so, to let the plant have even light. If you put it in a shady place, it’ll still grow, but slower. Spathiphyllum or Peace lily: they have dark green leaves and white “flowers” that are actually a specialized leaf bract that grows hooded over the “real” small flowers and catch the attention of pollinators. You may think they need extra attention because of the flowers, but they really don’t and that’s what makes them perfect for someone new in the plants’ world. Cut brown, yellow or soft unhealthy leaves; re-pot when it’s big enough to cover the container and cut away rotted roots. Find a (moderate) bright windowsill and test its adaption to the spot. Use good draining soil, roots are the most important thing to care. Buy a container with little holes around it, this will let the roots to breathe. Use a specific fertilizer for orchids and when the bloom season is over is good to re-pot them with fresh soil, they will appreciate it! This is really a nice list of easy-growing/low-maintenance houseplants and they will reward you by giving you clean air, bright colors, and beautiful shapes at home. You can do this, try your skills with one of them and soon enough you’ll see that is totally doable, believe me, you’ll see and feel the difference at home. Transform your terrace in only few steps! I’m so excited to share my first Garden Design with you!, as I explain on my profile, every project and its information is going to be public so you all can get ideas for your own garden needs. And a space for aromatic plants because they love to cook. The terrace is placed in the 4th and last floor, pointing to North, it means that each side of the garden is going to have sunlight for at least a couple of hours during the day. It turns convenient because every angle can be used depending on the needs. One thing to know about me is that I really struggle with unused spaces and stuff, I always try to have functional things and (obviously) space, I believe we should all enjoy every angle of our home and that’s what I’m doing here. It was designed as a seating area, with an outdoor sofa in dark wood with cream cushions and a tea table in the same material. On each side of the sofa, tall containers carry white hortensias (Hydrangea macrophylla) which will grant elegance to the terrace. On the right side of the couch, star jasmine (Trachelospermum jasminoides) that gives privacy and in the same containers, a line of iris bulbs like Iris ‘Wedgwood’ for a touch of color and shapes during blooming time. Hortensias are already elegant, if we use them in white and in tall containers they will look amazing. Iris it has purple blue flowers with a yellow mark on the center, it grows up to 65cm tall and blooms between late spring and early summer. These girls love maples so the main angle will be a perfect spot for some colorful maples, it could be a new sitting area in the future so having all the plants in separate containers can be a good option for those who love changes. The same line of containers carries red and acid green maples. Those are filled with small ivy (Hedera helix) that gives a falling effect and different shapes to the garden. Winter bulbs like snowdrops (Galanthus elwesii) will make the difference in cold seasons, mixed in the same container with the ivy. Acer palmatum ‘Sango-kaku’ is a 6m tall maple with yellow-green leaves and red coral branches visible during the winter. This maple is in constant color change, even in winter, when it has no leaves and the red brunches will give another shade to the garden. Acer palmatum ‘Bloodgood’ is a 5m tall maple, with dark red leaves that change into vibrant red in autumn. Small but strong plants surround the A. p. ‘Sango-kaku’, like Hosta ‘Halcyon’ nice and compact shrub, loves partial sun to full shade, tall 35-40cm and 70cm wide. It has blue-grey heart-shaped leaves and grey-lavender bell-shaped flowers. Another great shrub is the dramatic coral bell (Heuchera x ‘Midnight Bayou’) with red foliage, perfect for growing in containers and beautiful in contrast to green foliage plants. It grows well in partial sun, it is 30cm tall and 50cm wide, in summer it forms stems with white little flowers. Next to the A. p. ‘Bloodgood’ goes the or blue fescue (Festuca glauca), an evergreen grass, tall 30cm and blue-gray foliage of erect tufts, it stands up under the red maple foliage. Some aromatics will help these girls relax while sunbathing, a free space and seating area that’s not visible from the tea area, thanks to the shape of the terrace and the plant selection. The aromatics selection is always easy and hard at the same time, all of them are beautiful and tasty. Perennial shrubs like rosemary, chives, and sage will work just fine to look at and to cook. Other herbs like basil and parsley are placed in separate containers so they can rotate and change them in winter. Other annual plants are dispersed around the terrace, like geraniums (Pelargonium) that they can alternate every year with bulbs. Another small shrub will look good here and it’s the evergreen known as elephant’s ears (Bergenia cordifolia ‘Purpurea’); It has rounded deep green leaves that turn into purple in winter, it’s 60cm tall and it’s perfect to help the garden looking alive in winter. It’s all about colors during the different seasons, contrasts between colors and shapes is all it takes to start a good project, I hope you’ve enjoyed it!. We are in beautiful Italy, it’s summer, it’s sunny and there’re big quantities of gelato. Last Sunday I decided to visit Villa del Balbianello in Lake Como (North Italy), somehow I always thought about this kind of places to be full of tourist and I rather go first to the “local” places, but, obviously, there’s a reason why they are so famous, and I’m glad I finally did it (after a long time, may I add). Villa del Balbianello is part of the Italian National Trust (Fondo Ambiente Italiano – FAI) which owns a list of awesome historic buildings and gardens. Villa del Balbianello had existed since the 13th century and its firsts residents were Franciscan Monks. In 1785, the Villa was purchased and the changes in the building and gardens started, along with new owners until 1988, when its last owner died. Guido Monzino, the last owner, was a renowned Milanese businessman, art collector and a passionate traveler who left the Villa, the Gardens, the furnishing to the Italian National Trust; He also donated a dowry which still helps to cover the Villa and Gardens maintenance. Since then, they have renovated the Villa and partly turned it into a private Museum with Monzino’s art collection, memorabilia from his famous expeditions to the North Pole and the Everest (between 1971 and 1973) and, they’ve also renovated the Gardens. This time I only entered the Gardens, the thing I love the most and what I wanted to show you. The gardens frame the Villa, they’re developed in different floors and paths, as they follow the rocky mountain shape. From the beginning the big shaped “Platanus acerifolia“ stand out, a nice “Magnolia“ and alternating “Hydrangeas“ follow the paths. Then, as you keep walking, the Lake takes control of the view, it just blends with the gardens like a perfect painting. The most interesting thing about this garden is that, because of the rugged terrain, they couldn’t design a formal “Italian garden” nor a romantic “English garden”, so, they had to work and create paths around the Villa and make a unique space that gives you the opportunity to enjoy the lake from different angles. You really get to discover different scenarios just by descending the paths. They made a pact, between the formality of the design and the “informality” of the nature when they design the Gardens. Numerous statues guard the surroundings of the Villa and get to watch the Lake through every season. You can use some of this plants to make your garden a “Royal Garden“, it’s always worth to invest in some strong and long-lasting plants, you’ll get your reward, trust me. You have to walk/hike (nothing complicated) a few minutes to arrive to the actual Villa. Also, I took the bus to get to the Villa; It’s about 45min from the Lake Como’s bus station and the price was around 6$ round trip. Lenno is the name of the village and the bus stop. This time, I’m trying to give my blog a new and fresh direction, so today, I’m going to talk about one of my favorite trips I took this year. The destination: Morocco. Last spring we (my partner and I) decided to go for the first time to Africa, this sunny and kind continent that we knew nothing about, its people, its food, culture… we knew nothing, so we booked a flight to the nearest and convenient place for both of us. I mean, I wanted to see some gardens, my BF wanted to do some surfing and both of us needed to eat some good stuff. So, we arrived into chaotic Marrakesh, where we were welcome with some mint tea and amazing cookies (already in love with the city). I dedicated myself to find some good green spots (very difficult, especially the “green” part) to visit while relaxing at the Riad near to the city center, although, the riad had some vines, cactus and rose smell that make you feel in a natural place from the moment you arrive. Majorelle Garden is a Villa where a Botanical Garden take place along with an Archaeological Museum. It took us about an hour to visit the gardens but you can bring a book and relax sitting in the shade of their palm trees and bamboo selections. A public open space diverse from others in Marrakesh, with nice refreshing and shade areas designed by the French painter Jaques Majorelle, passionate about botanics and gardening, who put heart and soul to the gardens and it shows. Jaques Majorelle bought the villa in 1923 and also, a rare variety of trees and plants for over 40 years, creating this unique and relaxing space. – Tree ferns, among others. This was the first time I saw a plant selection like this in the harmony of a real open garden, it was different, eye-catching, beautiful and surprisingly fresh. Yves Saint Laurent and Pierre Bergé bought the Jardin Majorelle in 1980. They renamed it Villa Oasis, and undertook the restoration of the garden in order to “make the Jardin Majorelle become the most beautiful garden – by respecting the vision of Jacques Majorelle.”. Echinocactus grusonii: known as golden barrel cactus or mother-in-law cushion (pretty funny), is a spherically shaped cactus, endemic to east-central Mexico. It can reach 1m tall with sharp spines from yellow to white colors. It looks great in rock gardens, it obviously needs its space and it blossoms after 20 years old, so, if you like it, buy it for the beautiful shape. Pilosocereus azureus: columnar Cactaceae with beautiful blue stems, hairy areoles, and golden spines. It’s very interesting for indoor spaces because of its slow growth, blue color and big flowers that cover the stems during the summer. Carnegia gigantea: known as Saguaro, you probably relate it to western films (I do), it is a tree-like cactus with white flowers from April to June and it goes from 12m to 21m tall. Very flashy.